The country was sad to learn of the death of Irish actor Pat Laffan last week, the man behind two of the most fondly remembered Irish characters; Father Ted milkman Pat Mustard and The Snapper's Georgie Burgess. Following his death, the actor was trending on social media as people shared their memories of some of his more memorable roles and quotes, especially as promiscuous milkman Pat Mustard in the hit Channel 4 series. Mustard has become a bit of cult hero among Father Ted fans as somewhat of a loveable rogue who in fact tried to kill Dougal on a milk float in a particularly memorable episode. His memory reached as far as Edenderry on St Patrick's Day when one exhibitor paid homage to one of his most daring quotes and the show's most outrageously funny scenes. 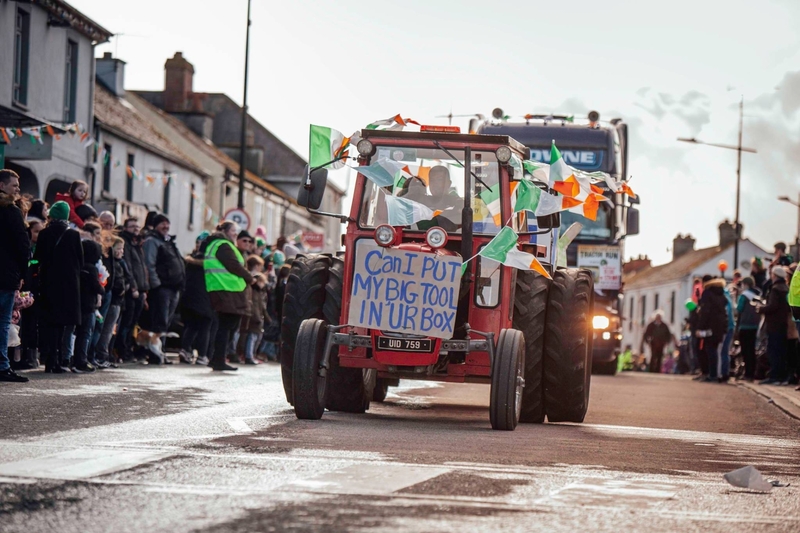 The vintage tractor was emblazoned with a banner saying, "Can I put my big tool in your box," reminiscent of the scene where Pat Mustard asked Mrs Doyle if he can store his spanner in her toolbox. It was all innocent, well fairly innocent, in the end, as the infamous scene proves. You can view Jeremy Simpson's other photographs from Edenderry's St. Patrick's Day parade by visiting his Facebook page, Jeremy's Photo Collection.